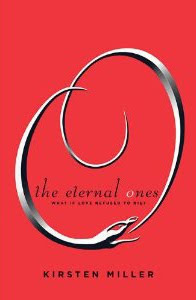 I was absolutely in love with the idea behind THE ETERNAL ONES – the idea that certain loves are so strong that they bind souls across multiple lifetimes and each new life is a chance to love again. It’s a tantalizing, intoxicating premise and Author Kirsten Miller (who looks so much like a high school friend of mine, it’s scary) pulls it off for the most part. It does start out slow, and the first section seems only to exist to make sure the reader knows that Haven is not missing out on anything by skipping out on her current life to research past lives. The townspeople, with the exception of Haven’s fab best friend Beau, are grating and I was sorely tempted to skim so I could get to the good parts quicker. The good parts, of course, commence with Haven’s explosive first meeting with Iain. I admit I read this section about 10 times I was so taken with the giddy romantic feel of it. Naturally the course of true love never runs smooth, so we see Haven start to doubt Iain, who engages in all sorts of inexplicably shady behavior. As Haven digs deeper into her past lives and gets closer to the mysterious society that reaches out to her, the tension mounts. Who can Haven trust? Iain/Ethan is the novel’s biggest asset, but not perfectly executed. He’s terrifyingly magnetic, but although my emotional swoon was set to full tilt, my intellectual swoon was more cautious. I think it’s just that we are promised a more swoonworthy Iain than is actually delivered on the page. No matter – even days later, I can’t stop thinking about him and the novel, and that’s a sign of a winner. THE ETERNAL ONES comes out in hardcover on August 10th. Find out more about it at the official website. You know, I just accepted a review copy of this one and this review has made me extremely excited to read it. I love that its such a new concept on the love story, and hopefully I will and enjoy it as much as you did. Thanks for the review! I loved the idea of the plot too, and I thought the mystery/reincarnation parts of the story were pretty awesome...but the love story and Ethan/Iain was a little too creeptastic for me. I have a feeling this book is going to be huge. Great review! I loved the book if not only for the reason that I think it shows that YA can grow and can be very literary. I agree that Ian/Ethan could have been more swoon-worthy and Haven's town was about 30 minutes from where I grew up! I don't consider myself a romantic, but with that plot, I'm ready to throw myself at it shamelessly. I love how you were able to distinguish between your emotional swoon and your intellectual swoon. Often one dwarfs the other and messes up the perspective! The premise behind this book is very intriguing to me, so even if it flounders a little bit in the beginning, I am willing to take a chance with it. I am so glad that you ended up enjoying it and that it is still making you think far after you've turned the last page. I agree with you, that is the mark of a winning book! I just got this in the mail yesterday. I'm glad to see you enjoyed it. I'm hit or miss with time travel type stories, so I'm not sure if I'll try this one or not. Great review though! Lovely review. The premise for this is definitely one the romantic in me adores, and I can't wait to read it. I love the concept of this, too, and with a part that you read at least 10 times, I will DEFINITELY have to read this one! I love this premise so much and look forward to reading it! I want to read this so bad. I just love the plot! I like me a winner! I've heard primarily good things about this one so I think I'll pick it up. Sorry...I accidentally removed my post...how silly...I just wanted to say that I just pre ordered this book and can't wait to read it...I loved the cover, too. I've had this ARC forever and had no idea what it was about. Hopefully I'll get to it soon. Thanks for the review! Love the premise of this book! Also, love a male lead that can make you swoon. I'm really excited about reading this one for myself. It sounds super romantic, but I'm starting to get nervous about reading it with all the "creeptastic" comments from everyone. Thanks for the review. Buffalo in the Wild: Your contest entries!